the development of a potential 'vaccine' for coeliac disease. The world’s first potential vaccine for coeliac disease has shown promising results for treating coeliac disease in a Phase I clinical trial and is expected to move to Phase II trials within the next year. 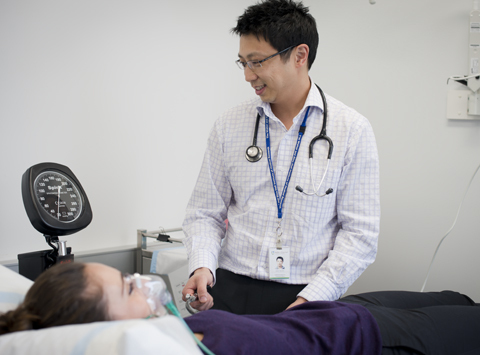 The Phase I trial undertaken in Melbourne, Australia, evaluated the safety, tolerability and bioactivity of the vaccine Nexvax2®, which has been developed for coeliac disease. Coeliac disease is an autoimmune disease caused by an immune reaction to the gluten protein found in wheat, rye and barley. The three peptides on which the vaccine is based were identified by Dr Bob Anderson from the Walter and Eliza Hall Institute’s Immunology division. The vaccine is being further developed by US biotechnology company ImmusanT, of which Dr Anderson is Chief Scientific and Medical Officer. Dr Anderson presented the Phase I trial results on Sunday at the Digestive Disease Week symposium in Chicago, Illinois, US. Up to one per cent of the global population is affected by coeliac disease, which is currently only treatable by eliminating gluten from the diet. In people with coeliac disease, immune cells react to gluten and trigger an immune response that damages the lining of the small intestine and inhibits its ability to absorb nutrients from food. Dr Anderson said the vaccine would be suitable for treating the approximately 90 per cent of coeliac disease patients with the DQ2 genetic form of disease. The Phase I study evaluated the effect of weekly injections of Nexvax2® over three weeks in coeliac patients on a strict gluten-free diet. At the highest doses, some patients had gastrointestinal symptoms similar to what they’d experience after eating gluten products. This suggests the vaccine uses the correct peptides for eventually being able to tolerate gluten. Dr Anderson said the peptides used as part of the vaccine could also be used to improve diagnostic testing of coeliac disease. ImmusanT is collaborating with INOVA Diagnostics to develop improved serologic tests for coeliac disease. In addition, ImmusanT is developing a functional T-cell diagnostic, designed to be used both as a standalone test as well as a monitoring test for Nexvax2. Please follow ImmusanT’s progress at www.immusanT.com. Our research has explained why oats are toxic to some people with coeliac disease.